Standing before Feldstone Manor, site of so many happy memories, Rose Davenport feels nothing but dread. Her family’s annual visit to the stately home was once brightened by her friendship with the earl’s youngest son, William, but everything changed the day his elder brother was disinherited and William became heir to his father’s earldom. From that moment, William made it clear he has no interest in continuing an acquaintance with Rose. Heartbroken, she sets out to prove that she will simply not be ignored—or outdone—by the arrogant future lord of the manor. I love when I find a great Regency Romance that’s fun, clean, romantic and just an all around great read. This one fits all of those things! I loved Rose with all of her quirks. She gets sick riding in a carriage. Rose loves her namesake roses. She even gets mad at William for his having removed her favorite ones. There are so many great things to love about her! I really loved seeing the backstory between Rose and William through her eyes. It made me a bit sad to see how they went from being great friends, to completely ignoring each other. I also loved the compassion she had for everyone around her, even if she didn’t know them. The way Rose took to the small boy stuck in the chimney really touched me. I wasn’t sure what to think of William for a good portion of this book. I wanted to like him, because of the things Rose thought about from their past. But I had a hard time reconciling her memories of him to the reality of how he treated her. He was hard and unkind. I was glad to see him start to change back, but hoped it would last. There are so many fun and well-written characters in this one. I love Rose’s mom. She made me laugh several times. There’s a certain scene with a hat that comes to mind. Rose’s sister Elizabeth was another character I loved. I loved “seeing” the two sisters together, they’re what I imagine a perfect sister relationship to be. Then there’s the men that Rose meets at all the balls. There are several that just made me laugh. I loved the plot of this one. It’s well written, not at all stuffy and boring like some Regency Romances can be. I can’t wait to read more books by this author! 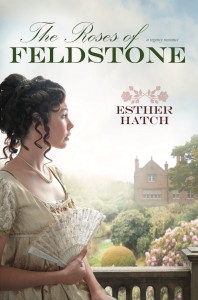 I was sent a gift copy of The Roses of Feldstone by the publisher. All opinions are my own. Check out the other stops on the blog tour!